The Garage Door Centre have been working alongisde Rundum Meir for around 20 years now, and have been involved in many projects where their high quality, specialist doors have been required. Manufactured in Germany, Rundum Meir produce bespoke timber and steel garage doors of outstanding quality and versatility. With their expertise dating back to 1968, they are able to prove their success in various ways, one being their certification for outstanding environmental production methods in 1998 from the Bavarian State Minister for the environment. 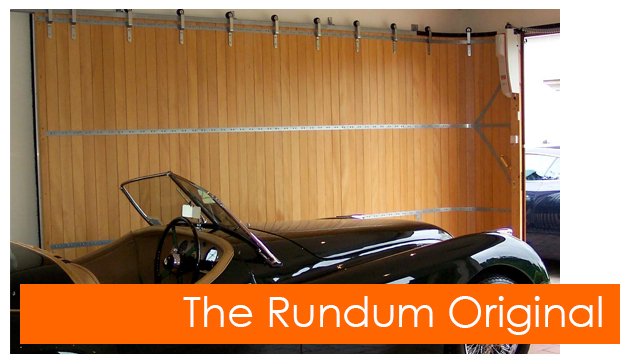 There are now three types of garage door that Rundum Meir produce: the ‘original’ round the corner door, the ‘side sectional’ door and the ‘sectional overhead’. 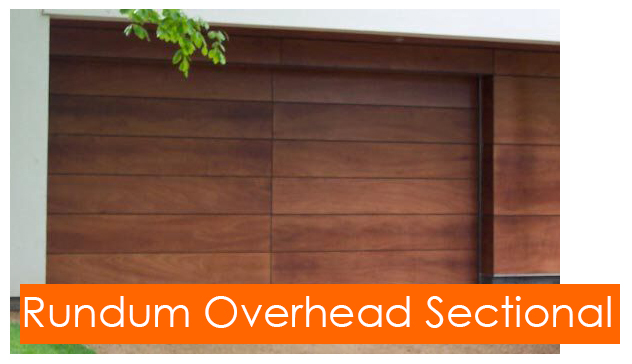 Whether you have limited headroom, or need to park vehicles either side of the door, Reundum Meir have the solution for the entrance to your garage. The Rundum Original is a unique round the corner door system that is manufactured entirely from timber or steel, and is designed with the ability to manoeuvre around obstacles in a garage such as brick pier or pipework, etc. The tracking system can be curved to follow walls and optimise the space inside your garage, or indeed be adapted to the design of unusual shaped entrances. Due to the vertical ribbed style using small, individual slats, the doors have high levels of manoeuvrability. Almost any obstacle can be overcome due to the flexible top and bottom tracking system, maximising the room inside your garage. As the doors do not swing out, they can be installed behind any shape of garage opening. Whether the door is manually or electrically operated, it does so smoothly, with very little sound and without the use of springs or cables, which would run out over time. The versatility of this type of door is almost endless as the doors can either be single or bi-parting (2 doors), allowing the door to be fitted in spaces of various shapes and sizes. The high quality of the timber prevents problematic movements that may affect the door in the future; high quality factory treatments are also available at an extra cost to ensure your door is installed on the day without any further decoration. 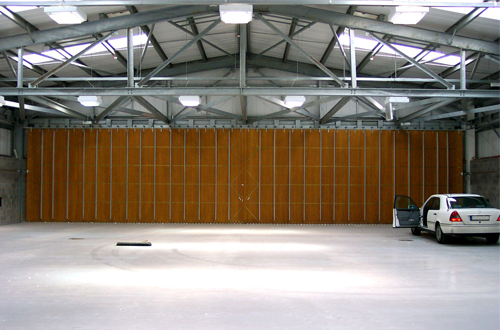 The image (right) shows a 20 metre by 4 metre Rundum installed by The Garage Door Centre on a large salt store. The combination of timber and stainless steel components proved to be the best option for use in this particular environment, whilst the enormous size presented no problem in manual or electric operation. Internally, there are minimal headroom requirements, meaning no height is lost, not affecting larger vehicles. There is also an optional false wall system available to allow space for shelving, etc. to remain fixed whilst the door runs neatly behind. Alternatively, these doors can be constructed from double skinned aluminium or galvanised steel sections with various colour finishes available. The opening and closing of a Rundum Meir round the corner garage door can be carried out with a minimum amount of effort and, as they slide sideways, allows the user to park vehicles directly before and behind the door. Both doors conveniently combine the functions of both a garage door and a pedestrian door with consideration of the various uses a garage may have. The round the corner doors can open a certain width depending on your circumstance; open the door a fraction for a convenient pedestrian entrance, halfway for one car or, on a double-width garage, the entire way for both cars. Additionally, the round the corner doors can be either manually or electrically operated. There are no restrictions on width for triple, quadruple or wider openings in a single door unit or bi-parting system. Our biggest door-width to date has been approximately 20 metres, and the door was easy to operate manually when required! The Rundum Meir side sectional gives you the ability to create a very individual and unique design in the exterior face of the door, as well as the choice of some traditional standard designs. Unlike the other manufacturers of sectional timber doors, the Rundum doors do have options on the timber species available, with bespoke designs their strength. The principle of the side sectional door is exactly the same as the Rundum Original in terms of the basic tracking it offers, albeit these doors require a twin rack near the garage entrance. The side opening is the same, however the door is constructed from individual timber cassettes, thus enabling infinite designs to be created either by traditional joinery methods or by computer routing a design into a composite timber cassette. The individual panels are sizeable compared to the narrow, individual timber slats of the Original door, allowing for the option of windows, false hinges and other types of ironmongery. Rundum Meir side sectional garage doors can have designs routed into the face of each cassette, as well as having optional windows installed. The lines are created by a state of the art, computer-controlled routing machine. The machine cuts a groove into the face of the timber to create standard designs or those which have been created especially to match the architectural features of the building or period. See the door in action! Click on the links below to see a Rundum side sectional door in operation. The Rundum Sectional Overhead Doors are exclusively constructed from high quality timber; the range offers garage doors manufactured in Hemlock, Larch, European Oak, Mahogany, Cedar and Iroko, as well as several other timber species, all of which are bespoke and made to your exact requirements. The sectional doors are available up to 5000mm wide and 3000mm high, with various headroom options for the operating mechanism in manual or remote control options. Standard designs are available, but Rundum specialise in producing mainly bespoke designs for various prestigous projects. Interested? Any Questions? Contact The Garage Door Centre today! Call 01933 229135 to be put straight through to a member of our knowledgable, professional team who can advise you on what to do next based on your own, personal specifications.